Want to Get Out of Debt? Don't Do This! Want to Get Out of Debt? Don’t Do This! I’ve been telling people for years that best way to pay off credit card debt isn’t necessarily to pay off high interest rate credit card debt first – and now, finally, a research study backs up what I’ve been saying. Before I tell you about the research, however, let me first explain why I disagree with the advice so often recommended by most every single personal finance expert out there. They all tell you to pay off your high interest rate credit card debt first. Well, I never saw a huge amount of value in this strategy for several reasons. For starters, if it worked so well, how come year after year Americans get deeper into debt? And how come so many people struggling to get out of debt try this strategy and fail? In my mind, if the suggestion to “pay your high rate credit card balances first” was so effective, scores of people would have gotten out of debt a long time. But the truth is: this strategy really doesn’t work for most people. And the reason it doesn’t work is simple: It doesn’t help you quickly see the benefits of your efforts, and therefore people aren’t motivated to stick with this strategy. When you pay off your high interest rate debt first, your credit card balances seem to barely budge. And if you don’t get the satisfaction seeing your credit card balances decline, you’re not likely to stick to the debt payoff plan. It’s as simple as that. I could compare it to people who diet in order to lose weight. If you slave away in the gym, improve your eating habits, and change from a sedentary lifestyle to an active lifestyle, then you step on the scale and it hasn’t budged, you’re going to get discouraged and quit. But if you lose weight, you feel energized and have the motivation to continue your weight loss efforts. Likewise, assume you pay a few hundred dollars a month for six months on your credit card balances. But you’ve got about the U.S. average of $10,000 in credit card debt. If you’re trying to first pay off high rate debt, each month you get your statement, and you notice that your balance has gone down by only a small amount. Virtually all the money you’ve paid has gone toward interest. While that’s helping to make the credit card companies rich, it’s not doing a thing for you. But what if you changed your approach? Let’s assume that instead of worrying about which cards have the highest interest, you simply started paying off your credit cards by targeting the ones with the smallest dollar balances. I can tell you what would happen: you will quickly see some positive results. You might have 10 credit cards, and then you rapidly pay off the first, the second and then the third one. But you do this in fast succession by going after those small balances – not by focusing cards with high interest rates. And when those cards start having a zero balance, you feel good about that. 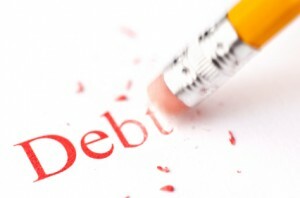 So you’re encouraged to keep paying off your debts – which brings me to the research study. Researchers from Northwestern University’s Kellogg School of Management found that people who have large credit card balances are more likely to pay down their entire debt balance if they just focus on paying off cards with the smallest balances first – even if that approach doesn’t seem to make economic sense. Again, we’ve all have heard time and time again, “pay off your high interest rate credit card debt first.” The rationale behind that advice is that with this technique you’re going to pay the least amount in interest. So naturally that sounds like a rational, sound strategy. But let’s face it: when it comes to money matters, human beings simply aren’t completely rationale. Money isn’t just about dollars and statistics. There’s a huge emotional component to money as well. And as human beings, our brains want to do things that make us feel good. Of course, when you’re knocking out debt, the “snowball method” is the one that makes you feel good, because you pay off those small balances first, and you keep building up until you ultimately eliminate the bigger ones later too. So for all of you out there trying to dig out of credit card debt: I’ve said it before and I’ll say it again. Attack your own area of pain. This just means eliminate the problem debt that’s bothering you. If high dollar balances are driving you crazy, knock down the cards with high dollar balances first. If it’s having too much overall debt or even just too many cards that is frustrating you, then pay down the small balances first. Don’t think for a minute that you have to always pay the highest credit card debt first. That’s simply not the best strategy because it’s not the most motivating technique. And in my book, if something isn’t working why do it? So try this strategy instead. Make a quick list of your credit cards and look at the one with the smallest dollar balance. Then aggressively and quickly pay that one off. Go ahead and pay extra on it – more than the minimum balance. Double or triple your payment. Do whatever it takes: just get the card balance to zero as soon as possible. Then take the money you had been paying on that card and put it on the next card with the lowest balance. Once that card is paid off, target your third card, and so on. Keep this process going and keep eliminating those cards one by one. I can promise you that when you do this, you’ll see how much your debt payoff efforts are working because you’re motivated and you’re getting these small victories with each and every card you pay off. This is the heart of what those Northwestern researchers, David Gal and Blakeley McShane, found when they looked at 6,000 people who had paid off their credit card debts. Again, these are people just like you who actually eliminated their credit card bills. I’m not talking about the people who just participated in programs, or people who tried to get out of debt. I mean people who successfully paid off their debts, just like I paid off my $100,000 in credit card debt. These folks got small victories by paying off the cards with the smallest dollar balances first. They didn’t worry about the interest rates. What have you got to lose besides that debt hanging over your head? By the way, in my New York Times bestseller Zero Debt: The Ultimate Guide to Financial Freedom, I devote an entire chapter to the explaining how to Pick a Proper Debt Payoff Strategy.